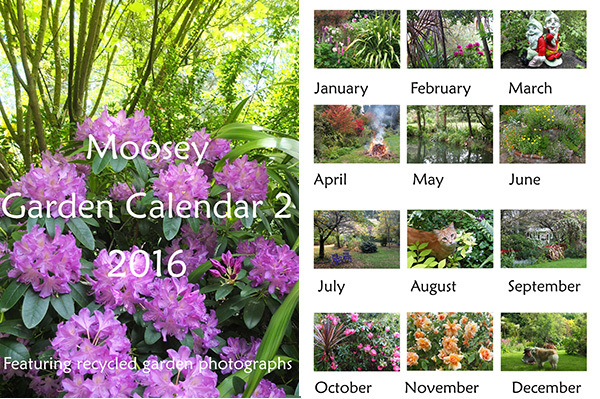 The 2016 calendars feature the Moosey Garden at its most colourful. In this first calendar, serious winter pictures have been banned, and autumn only gets one chance to show off its tawny shades. Roses, flowers, herbs, shrubs, and beautifully green lawns abound. 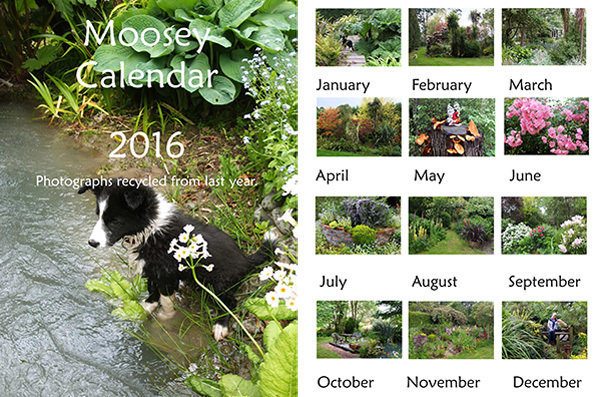 Just a few of the Moosey animals have sneaked into this next garden calendar. Fluff-Fluff my pale ginger gardening cat couldn't really be left out. And the dogs (Rusty and new puppy Winnie) seemed to always get themselves into my camera shots. So you'll meet both of them. I adore roses, but so many of these beauties have had to be missed out. I've concentrated on garden scenes, rather than close-ups of flowers. Hope you enjoy it. The photographs have all been recycled from 2015. One of my Garden Calendars for 2016 features garden scenes recycled from 2014 - the autumn bonfire, the herb spiral covered in flowers (oops), the purple wooden chairs - and there are guest appearances from Percy the cat and Rusty the dog. Maybe you'd like your own copy - it's free to download, of course. Enjoy! You'll also be able to peep through the trees at Pond Cottage, take a wander around the pond, and meet a couple of rakish-looking garden gnomes. Back in 2014 they were rather clean and fresh! 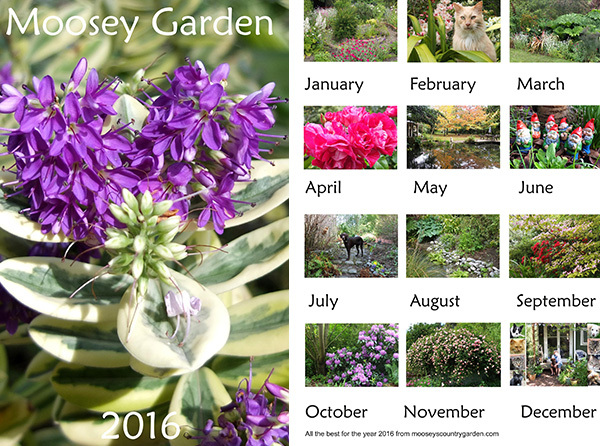 Here is my latest 2016 garden calendar with genuine 2016 photographs. I hope you'll enjoy the pictures - you'll see images of each page below. Please enjoy sharing my garden with me throughout the year. Adobe Acrobat Reader is required to view PDF files. This is a free program available from the Adobe Web Site. Follow the download directions on the Adobe web site to get your copy of Adobe Acrobat Reader. And check the printing options for PDF files - for example, you can just print off one page at a time, or fit two pages on one sheet of paper. Could be useful!